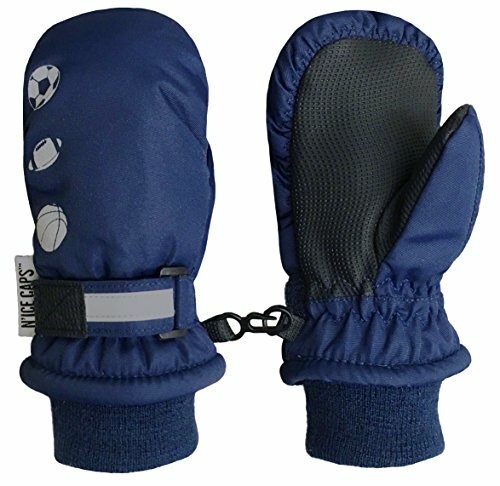 N'Ice Caps Kids Thinsulate and Waterproof Reflector Ski Mitten will be sure to keep your child warm and safe this winter! For added safety, the reflector trim is designed to light up when light shines on it while outdoors in the dark. The mittens feature bulky 3M Thinsulate insulation for warmth, and waterproof membrane lining to keep dry in wet conditions. Colors available: pink, fuchsia, lavender, black, navy, royal, neon yellow, neon pink, neon green, dark purple, red. Also available in reflector hearts print and reflector sports print. Size recommendations and product dimensions (Dimensions: Length is measured from the elastic along the wrist of the mitten to the end of the mitten fingers; Width is measured across the palm area of the mitten at the widest point): 1-2 years (4.0" length, 3.35 width); 2-3 years (4.5" length, 3.5" width); 3-4 years (5.0" length, 3.5" width); 4-5 Years (5.25" length, 3.75" width); 5-7 Years (5.75" length, 4.0" width); 7-9 Years (6.25" length, 4.25" width); 9-12 Years (6.5" length, 4.25" width). For size 1-2 years, the mittens do not have thumbs. Mitten clips are included with the mittens for certain sizes and colors where indicated.